Members of the Transition Los Angeles city hub core team and speakers bureau served as presenters and facilitators. The morning included an overview of the "triple crown" of problems (peak oil, climate change, and economic contraction), an explanation of the Transition approach, and some tips on Leadership for people who wished to start their own local Transition groups. The afternoon sessions included a visioning segment and a series of Open Space discussions, including a session where participants and veterans gathered by geography to discuss next steps for their home neighborhoods. During the "gathering by geography" portion, one circle was created for initiators who were working solo in their local neighborhood, to gather with the L.A. area's original initiator and discuss how to begin the spark of Transition. 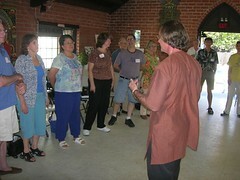 Throughout the day we utilized exercises and songs from Joanna Macy's websites. In the feedback session, participants admitted these segments pushed them out of their comfort zones, but in ways that many people very much appreciated. The content of all the presentations was specifically oriented to the Transition action already ongoing in the greater Los Angeles area. Presenters' stories and images came almost entirely from our own local experience (although a brief segment on the history of the Transition movement in the UK, international network, & US was offered). Area-wide issues and examples of local events were very present throughout the day. Since Transition in the Los Angeles area is now unfolding in more than six local "pods" (local groups), each with widely varied circumstances, there was plenty of material for conference attendees to identify with. It was designed to help participants understand how they could join in. Some of our goals for the mini-conference included helping participants feel they were joining a movement that was already in force rather than feeling alone; jump-starting Transition action across the wider area and bringing along those who were starting new pods; and encouraging new initiators to consider forming new local pods in untapped areas. 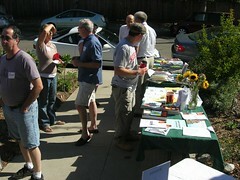 Even during the morning presentations, we were handing out "Transition tools" for people to use at home. The peak oil and climate change portion was done via a homemade Self-Teach. We used exercises straight out of Hopkins' Transition Handbook for the icebreakers. 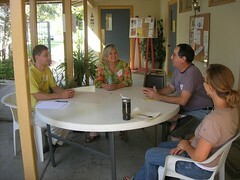 The visioning session revealed the techniques Transition Los Angeles has currently been using with audiences across the area. We included lunch -- homemade vegetarian salads which emphasized local ingredients. The site facilities allowed us able to serve on real china plates with cloth napkins, underscoring how we Walk the Talk. At lunchtime, participants could stroll in the community garden on the site, and many circles chose to take the breakout sessions outdoors. Transition Los Angeles consciously designed the day with very low inputs, so that it would be feasible at extremely low tuition cost ($35). As a result, the event filled quickly. We were forced to close registration when the room capacity was filled, leaving many would-be participants unserved. We are already discussing repeating our home-made mini-conference format after the first of the year. If you are in the greater Los Angeles area and are interested in possibly attending a future session of the Life After Oil one-day mini-conference, please join the Transition Los Angeles mailing list in order to be informed of dates and registration information.